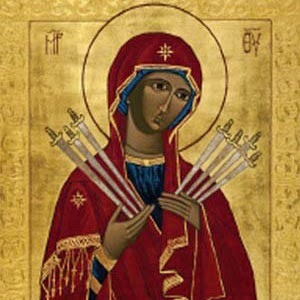 Today is the feast day of Our Lady of Sorrows. This is a title of the Blessed Virgin Mary and is not another Virgin Mary as some Protestants and atheists such as the late Christopher Hitchens thought. There is only one Virgin Mary. The Church has several titles for her. This title is a commemoration of the sorrows that Mary faced. These Seven Sorrows should not be confused with the five Sorrowful Mysteries of the Rosary. Mary suffered a lot during her lifetime. While she didn't suffer like her son Jesus, Mary did suffer with Him as she watched Him carry the Cross and die. Mary was like any mother who suffers whenever a child suffers. Imagine watching your son being harassed, arrested, spit on, and killed? The pain can be immeasurable. This tells us how human Mary was despite knowing her son was God. Celebrating Our Lady under this title of Our Lady of Sorrows began in Cologne, Germany. Prior to this in 1233, the Servite Order. Devotion began to spread throughout Europe among different orders with some even adopting the black scapular which is used by the Servite Order. Devotion to Our Lady of Sorrows should recall the passion of Christ and how we should unite our suffering to His. As a role model, Mary shows us how to be truly human experiencing sorrow and suffering for the sake of Christ and not use it to bring self-pity or give up on life. I recall this feast day well because it was the first time I ever drank from the chalice. May Our Lady of Sorrows pray for us.